Reference number for this case: 8-Oct-54-Sauvigny-le-Bois. Thank you for including this reference number in any correspondence with me regarding this case. 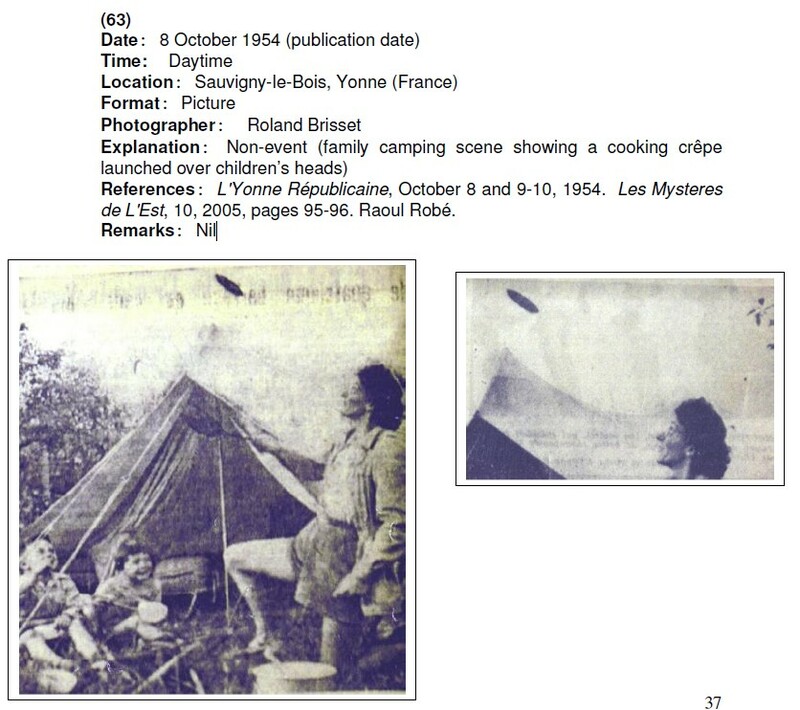 In the years 2000, Spanish ufologist Juan-Vicente Ballester-Olmos published in his catalogue of the alleged UFO photographs of year 1954 an image originally published in the newspaper L'Yonne Républicaine for October 8, 1954, and taken from the "skeptical" publication Les Mystères de l'Est, for 2005, where it had been reproduced by Raoul Robé. The image shows a scene of family camp-site in which a pancake is launched in the air, evoking a flying saucer. I suspect, as there were two articles over two days in the newspaper L'Yonne Républicaine, that this newspaper had initially published the photograph as a challenge for readers to explain it, and that in the following issue the newspaper had given the answer. References: L'Yonne Républicaine, October 8 and 9-10, 1954. Les Mysteres de L'Est, 10, 2005, pages 95-96. Raoul Robé. This image was probably never published as a UFO photo - I found no mention of this in the ufology literature - but rather as amusing anecdote. The ufological interest of this story seems quite limited to me, and the information given is very meager. I suspect, as there were two articles over two days in the newspaper L'Yonne Républicaine, that this newspaper had initially published the photograph with a challenger for readers to explain it, and that in the following issue the newspaper had given the answer. Sauvigny-le-Bois, Yonne, photo, non-event, Roland Brisset. [---] Article in the regional newspaper L'Yonne Républicaine, France, October 8, 1954. [---] Article in the regional newspaper L'Yonne Républicaine, France, October 9-10, 1954. [---] Raoul Robé in the ufology magazine Les Mystères de L'Est, of the CNEGU ufology group, France, #10, pp 95-96, 2005. 1.0 Patrick Gross October 11, 2016 First published. 1.0 Patrick Gross February 20, 2017 Addition [ub1].